My fees are competitive, based at £40 per hour. If a job takes 15 minutes I charge you £10, 30 mins equals £20 etc. ​I can always offer a fixed quotation prior to commencing any works. Any requested additional works beyond the agreed initial remit are of course extra but again these will be discussed before proceeding. All drawings remain your property, will have your logo & details; my name is not shown. Upon completion of works the DWG CAD file is issued along with the Pdf. Payments can be made by Paypal or by Bank Transfer. For CAD works invoices are issued after completed works. ​These are drawn using the BS5837 guidance where each tree is displayed with a category identifier, tag text, canopy extents and its RPA. Additional options are available such as shading of RPA's, drawing both the existing & ultimate shadow extents, drawing ultimate canopy extents and additional text to show tree name, category etc if required. Overlapping RPA's can be merged with each other and a continuous polyline plotted along their boundary. RPA boundaries can also be analysed and adjusted in relation to obstacles. This process may require further information from the client to identify certain structures from the drawing. All drawn items are visually checked for clarity and text repositioned if necessary. Group boundary lines are adjusted for clarity. All items are drawn onto their own layers and coloured as required. On large or very dense sites a separate shadow extents plan may be useful. A typical small residential site with 10-20 trees will cost approximately £30-50 depending upon the state of data supplied. The Tree Protection Plan (TPP) would normally accompany a tree protection Method Statement for the site. The TPP shows all surveyed trees with their tag text and either a retain or remove symbol. It also would include the location of the protective fencing including their positional dimensions as text on the drawing. Also any areas which require special works such as trenching, surfacing, building within RPAs are included. 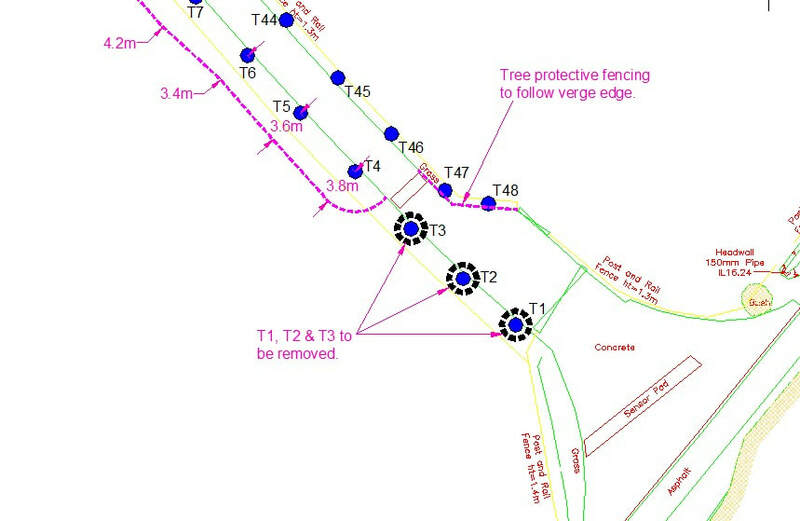 In some complicated situations additional TPP's may be required to cater for different stages of development on the site (such as movement of fencing as works proceed). Other items such as canopies, category colours can be included if required. The Tree Assessment Plan (TAP) is simply a TCP laid over a proposed site drawing. It enables a consultant to easily assess a proposed scheme in relation to existing trees and produce feedback to their client by way of a detailed or informal report. Such a plan is essential when producing an Arboricultural Implication Assessment (AIA) and may also be a plan requested by LPA's. The Tree Shadow Plan (TSP) is similar to the TAP plan but only shows shadow influence over the proposed site drawing. 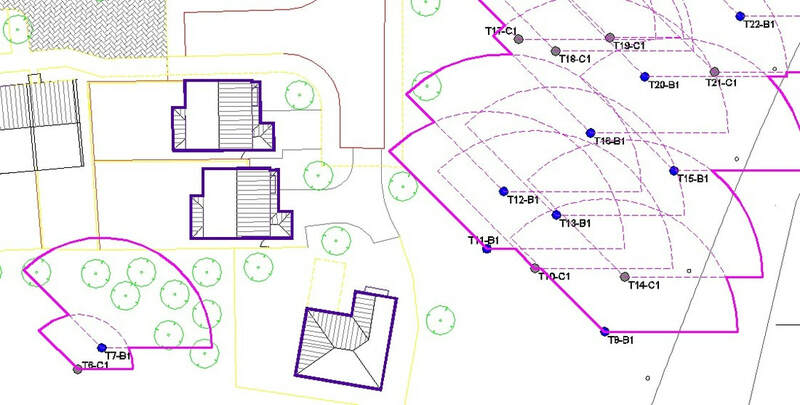 It enables a consultant to easily assess a proposed scheme in relation to shadows produced by existing trees and then produce feedback to their client. Such a plan is essential when producing an Arboricultural Implication Assessment (AIA). These are available for all types of ecological plan such as Phase 1 Habitat, vegetation, habitat, bat, butterfly, bird, mammal surveys etc. Areas are plotted with boundary lines (and/or hatching as required). Spot points can be represented using your own custom or recommended symbols. Other information is shown on the drawing as blocks of text with link arrows where necessary. 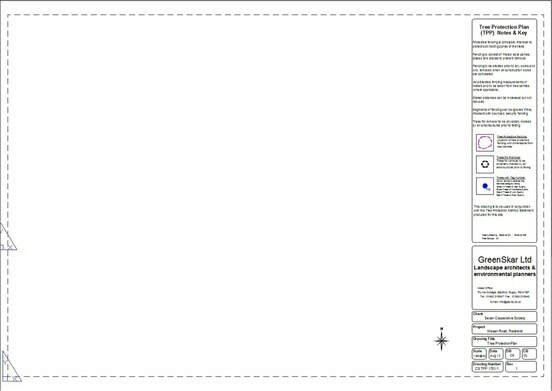 I am able to create templates of different paper sizes and scales with your own logo, address and key. Prices start from £20 and include a PDF sheet of instructions describing how to set up the model space within the viewbox, changing scales and adjusting for units used, etc. All drawings are supplied by email as a DWG and PDF. A number of items may be needed such as tree survey schedule, CAD topographical drawing, proposed drawings etc. These can be sent to me by email. Completed drawings and other documents are returned in digital format by email in whatever format is required. The tree survey schedule (list) can be supplied as an Excel, Word, Text (.txt) file or as an AxciScape file. I can also process paper listings (at extra cost). Each tree entry must supply the necessary data required for the works you require. 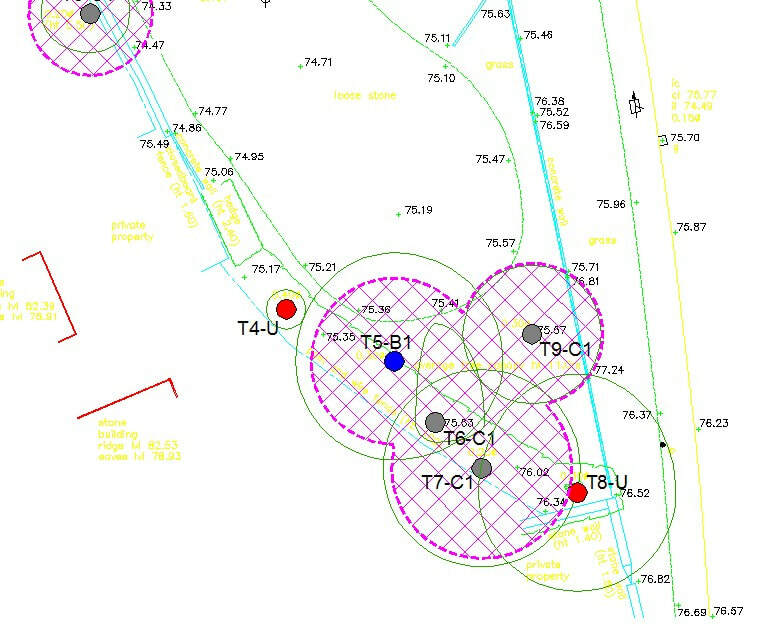 So for example, if you need a BS5837 TCP drawing I would need to know the trees tag (or ID) number, its diameter, its height, its canopy spreads, its category code and how many stems it has below 1.5m (so I can calculate the correct RPA area). If you also have ultimate canopy/height values these would allow additional data to be drawn. However, if I am just carrying out shadow analysis then only canopy spreads and height are really relevant. To carry out any CAD work I will need a drawing supplied in digital form as either a DXF or preferably an AutoCAD DWG format. I understand that some architects have yet to enter the digital world and will only supply a paper plan; in exceptional circumstances I can use a scanned plan but the final results would not be anywhere near as good as a proper digital file. Additionally its not unusual to be supplied with an Ordnance Survey (OS) base plan; although this would be in digital format, it would still lack any level data and other important features. Again this can be used if necessary. Drawings would be returned by email in a digital format as a DWG, DXF or PDF file. 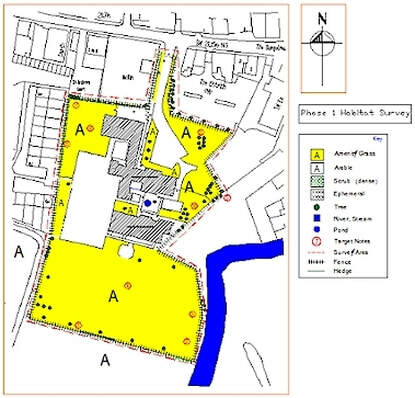 positions as a digital file or be supplied with a paper plan with their locations marked upon it (these would normally use the centres of plotted trees shown on the topographical but where these are missing may use a plot by eye position or include measurements from adjacent structures). Such plans can be posted or scanned/emailed to me.